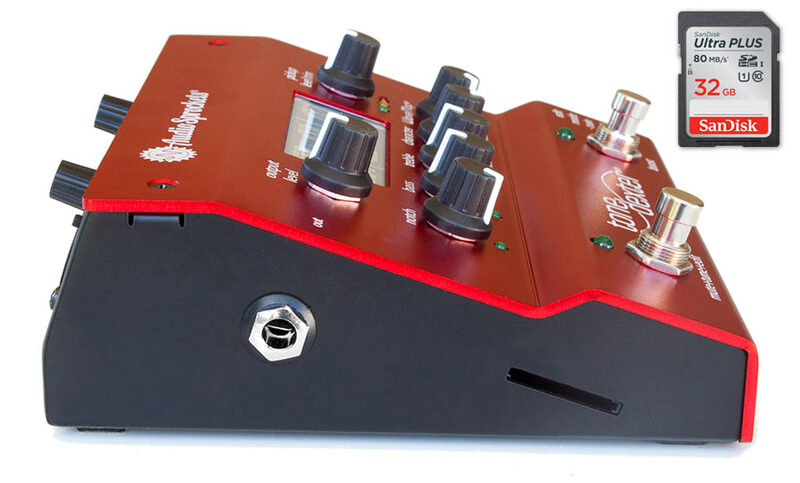 Upgrading the Firmware will not delete WaveMaps in your ToneDexter. Download the zip file corresponding to the firmware version you want to install, and put it someplace convenient on your computer, such as the desktop. Copy these three files to the root of an SD memory card. The root is simply the top level of your SD card so just drag and drop the three files (not the entire folder) over the SD card icon on your desktop. The card must be formatted as FAT32 (New cards are formatted as FAT32, on a Mac you can check using the Disk Utility application). It doesn’t matter if there are other files or directories on the card. Click open the SD card to verify the files are present at the root (not in a folder). Power down your ToneDexter by unplugging the power supply from the line (rather than by unplugging the power jack on the back of ToneDexter). Push the SD card into the slot on the side of ToneDexter, with the card contacts facing down. Make sure at least 15 seconds have elapsed (so that the internal voltage has time to decay), then plug the power supply back into the line. When ToneDexter powers up, it looks for the presence of an SD card and reads the files. If you forget to remove the SD card before the next power up, it will unnecessarily go through the upgrade process again at the next power up, but there will be no harm done. If you accidentally lose power during the upgrade process, just start the process over and all will be well. The app.bin file controls the user interface software, and tells ToneDexter which persona to be: GEN, HGH, or BAS. It loads first and only takes a few seconds. The dsp.bin file does all the signal processing. It loads after the app.bin file and takes about 2 minutes. Both versions need to match or else you will see ERR during the update process. For a given version of firmware, it is possible to change personas quickly by simply loading only the app.bin file, without the dsp.bin. To do this, simply put just the desired app.bin file (and optionally the identifying text file that comes with it) on the SD card, and follow the process above. You should see the change within 10 seconds. Training algorithm improvements resulting in a subtly smoother high end response, and a more natural sounding bass response. Training algorithm improvements. It’s 33% faster, and results in a slightly brighter sounding WaveMap. Not new: When auditioning WaveMaps in Freeze mode and selecting S to hear what’s currently stored in the slot, scrolling to another slot won’t play S (stored) audio in the new slot until you first scroll through T, M, P, and S in the new slot location. Support for getting WaveMaps into and out of the unit. Requires a separate procedure using the Transfer Utility which copies all WaveMaps onto an SD card, and optionally writes externally saved WaveMaps back into the unit. WaveMaps may be archived in libraries, sorted and/or renumbered to create new sets for reloading. WaveMaps are stored in a proprietary file format that only works in a ToneDexter. WaveMap Transfer Instructions. Bass EQ control is now a variable highpass filter when cutting. When boosting, the response is a low shelf, the same as it has been. Appropriate ranges are selected for all versions: BAS, GEN, and HGH. Improved tuner sensitivity and stability. When training, sometimes the dot on the display showed up in random places. With HGH firmware, switching banks caused temporary display of notch frequency. When sweeping the Boost knob, temporary display skipped some numbers and was hard to set. During Mute/Tune, the audio was unintentionally muted to the FX Send, as well as intentionally muted to the outputs. With this fix, outputs are muted but FX Send stays on so that an external tuner placed in the FX loop will still receive a signal. When auditioning WaveMaps in Freeze mode and selecting S to hear what’s currently stored in the slot, scrolling to another slot won’t play S (stored) audio in the new slot until you first scroll through T, M, P, and S in the new slot location. Bass (BAS) version: under some conditions, blending caused the sound to get thinner. When selecting a legacy (pre V1.30) WaveMap after selecting a new WaveMap that has blend operational, you would hear only raw pickup rather than the legacy WaveMap. When training, sometimes the dot on the display shows up in random places. With HGH or BAS firmware, switching banks causes temporary display of notch frequency. When sweeping the Boost knob, temporary display skips some numbers. Bass (BAS) version: under some conditions, a fizzy/fuzzy sound appeared on top of low notes. This was caused by the EQ, even when in the off position. Therefore, even WaveMaps created with earlier versions of firmware will be fixed by this release. Turning the CHARACTER knob too fast caused the temp display to show a value that didn’t reflect the actual setting. It had no impact on sound. With the fix, all but extreme turning speeds show accurate values. Under some conditions turning the CHARACTER caused an unintended very brief temporary display of Bxx. Turning the CHARACTER knob while in MUTE/TUNE mode caused an unintended temporary display of “CH2” or other upon returning to RUN mode. When selecting a legacy (pre V1.30) WaveMap after selecting a new WaveMap that has blend operational, you will hear only raw pickup rather than the legacy WaveMap. Blend control. For newly created WaveMaps, character adjustments CH2, CH1, and CH0 are accessible in the right half of CHARACTER knob rotation. When operating in the left half of its rotation, the control allows blending 0% to 70% of the raw pickup signal with 100% to 30% of the WaveMap. The raw pickup signal is polarity and time aligned with the WaveMap so that no comb filtering or weirdness occurs. For existing (legacy) WaveMaps, the blend control works as before with CH0, CH1, CH2 spanning the full rotation range. High (HGH) version code now designed for multi-instrumentalists. High bank slots 12-22 use EQ and notch params tailored for mandolin, violin, banjo, etc: low shelf starts at 250Hz, high shelf at 2KHz, notch range is 124 (B2) to 466 (A#4). Low bank slots 1-11 function the same a general (GEN) code: low shelf starts at 125Hz, high shelf at 2KHz, notch range is 73 (D2) to 392 (G4). Bass (BAS) version tuner sensitivity greatly improved. Level matching algorithm improved for better loudness match between WaveMaps and bypass. Paste and Delete function completions now return the user to RUN mode, rather than MUTE/TUNE/EDIT mode. This seems more user friendly and is easier to explain. When training with slot 22 (which skips feedback corrections), there was an unintended 3dB drop in level at FREEZE transition. Under rare conditions, WaveMap select control could be out of sync (off by one) with knob detent position. Under rare conditions, when using feedback notch, it was possible to get into an in-between condition that caused the temporary display to continually retrigger. When entering FREEZE mode during training, if CH0 or CH1 selected, extra clicking noise occurred. Turning the CHARACTER knob too fast causes the temp display to show a value that doesn’t reflect the actual setting. It has no impact on sound. Under some conditions turning the CHARACTER causes an unintended very brief temporary display of Bxx. It has no impact on sound. Turning the CHARACTER knob while in MUTE/TUNE mode causes an unintended temporary display of “CH2” upon returning to RUN mode, no matter what the actual CHARACTER mode is. It has no impact on sound. WaveMaps created in slot 22 are special in that the corrections to improve feedback immunity are skipped. This results in the most realistic miked sound which may be more useful for recording purposes. These WaveMaps can be pasted into any storage location. Anti-feedback adjustment of WaveMaps improved to have less midrange boost and better level matching. The mic path can now be auditioned right after the level setting phase of training, rather than having to wait for the complete training session. Temporary display of boost level when adjusting Boost volume control. Temporary display of character mode when adjusting Character control. Separate HGH (high) code release for banjo, violin, uke, etc. with higher notch frequency range, otherwise the same as GEN (general) code. Separate BAS (bass) code release for upright bass. EQ and notch ranges adjusted accordingly. Longer WaveMap length to accommodate lower frequencies. Bass WaveMaps exists in separate memory locations and do not interfere with general WaveMaps, so they can coexist in the same box. Low level 10KHz noise occurs just when bypassing a slot containing a WaveMap. When training from a slot with an existing WaveMap, the first time audition plays S, it plays new WaveMap rather than stored WaveMap. Next and subsequent times through it is correct. In audition modes P and M which have EQ disabled, EQ lights were not turned off. Intermittent temporary display of notch frequency when knob not fully CCW on some units. Temporary display of EQ not working properly in TRAIN mode after training complete but before storing WaveMap. Tapping BOOST switch occasionally gives double tap instead of single tap. Adjusting Notch control before temporary EQ display times out causes decimal point from EQ to show in Notch display.